Patent No. : ZL94 2 22876. M-600 portable valve grinding machines with high efficiency, being easy to carry and being easy to operate, can repair the valve sealing surface in the pipeline scene. 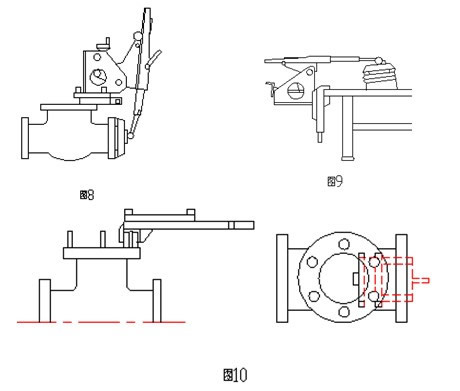 Applicable to the grinding of gate valve (Figure 2), globe valve (Figure 3), disc wedge(Figure 4)is High-tech national patent products. 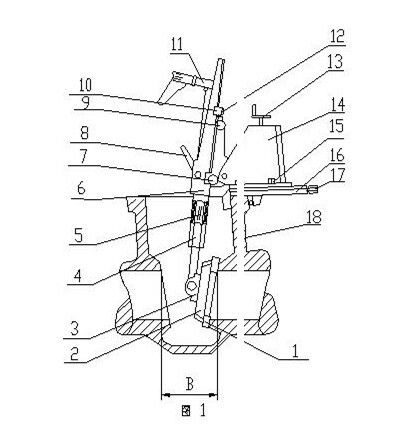 a) a fixture base 17 is fixed on the valve body19 by an adjustment screw bolt 18.
b) adjustment bracket 15is fixed on base 17 by screw bolt 16.
c) installing grinding claws in on grinding platen 2. Then linking joint platen 3. Prior to measure the centre diameter of the valve body and the sealed face. 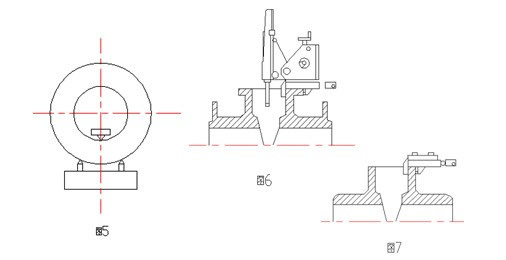 And then choose a suitable set of grinding platen and grinding claws to adjust, it is the best that the grinding sheets in grinding claws can cover all of Valve's grinded face and grinding sheets are located in the center of grided face.The size of Grinding Platen 2 which is Φ210, Φ240, Φ290, Φ350 is not adjustable and adjustable Φ190, Φ300 ,a total is six, The sizes of grinding claws are 62 mm, 85mm, 108mm, 203mm, a total is four,each is five. the grinding range I grinding platen with I grinding claws is Φ130 ~ 240 mm, the grinding range of I grinding platen with II grinding claws is Φ170 ~ Φ285 mm, II the grinding range of III grinding platen with II grinding claws isΦ270 ~ Φ440mm, II the grinding range of II grinding platen with IV grinding claws is Φ410 ~ Φ630 mm. d) the telescopic boom 4 is installed to the square-tube 6, rotating handle 8 to clamp. e) installing the square-tube 6 on the adjustment bracket 15, rotating handle 8 to clamp square-tube 6, putting the bulb of the swinging sliding guide into locating hole of the adjustment bracket, rotating the screw 10 to lock. 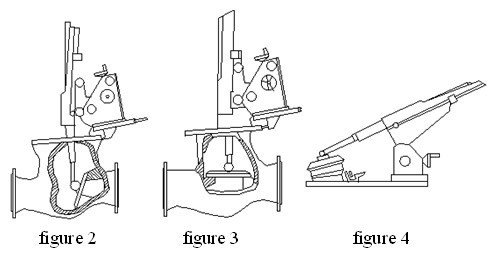 f)putting hexagon axis of the motor into hexagon hole of telescopic boom,locking by the screw 12.
g) rotating handle 9 and 14 to make the grinding sheets in grinding claws 1 accurate alignment and reclining on the grided face of the valve body.to a grinding claws on the ground of the film is accurate and paste Valve 19 of the grinding surface. h) with diamond-grinding sheets milling,it need water to cool. a) five grinding sheets can be adjusted to cover the grided face, it is highest possible to situated in the centre of the grided face. b)it is necessary to clean the dirt of the griding sheets before grinding sandpaper. c) it is necessary to stick five griding sheets slightly before work but not too much pressure. d)It should turn the griding platen by hand to listen to wether the sound is abnormal or not.After starting motor will adjusting to the pressure 2 ~ 3 kg by handle 14 ( That is,it is the most appropriate to to make speed of adjusting grinding pressure just slightly lower than the speed of no pressure and freedom rotation.It should repair that the demaged high parts to avoid impact the griding sheets and change the angle. e) ground before the injury was lapping of the high parts swap, in order to avoid collision grinding and Tablet change the angle of grinding. f) it should read carefully handarm Motor Manual. g) such as the operation location is high temprature and the wet adhesive tapeit is obsolete, it should to gride to use fixing screw to fix carborundum griding sheets on griding claw. mounting methods is three spot methods. Three spot of Fixing base 17 must be stable in the flange of valve body (see Figure 5). b)confirming griding platen lies in the center of the valve seat surface, adjusting handle 8 and 9 if error is occur. c) rotating handle 14 to make grinding sheets and grided face stick slightly. 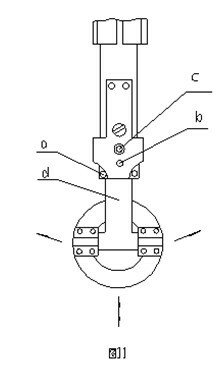 d)starting Motor to make griding head began to slow rotation without any resistance.generally the speed is adjusted to 80rpm if the valve is small. the speed is adjusted to 100rpm if the valve is greater. e) the handle 14 should feed consecutively and should not make grinding platen and the grided face loose. f) inspecting the grided surface and replace grinding sandpaper, the square-tube can put them back in situ without any adjustments to continue grinding after inspecting and replacing sandpaper . i) M-600 valve grinder should be carefully clean and remove abrasive sandpaper after it is used. j) the gear must be regularly clean and painted with grease (MoS2) or similar material, can not be exposed, so as to avoid damaging debris into gear. k) the gear of connecting platen should be added in a small amount of grease (MoS2) before use,it should be sealed after use, so as to avoid damaging debris into gear. Motor speed is controlled by changing the switch pressure, when pressing the switch slightly, a rotation rate is low, the speed is increased with the pressure increaseed, rotating speed governing wheel(clockwise rotation for the deceleration / counterclockwise rotation for growth), the rate of speed is up to necessary adjustment speed, pressing the control button, it can rotate continuously and automatically. When motor rotate,the rotating wheele can execute speed governing. When once again press the control button it can declutch self-actuated , relaxing swich is the downtime.